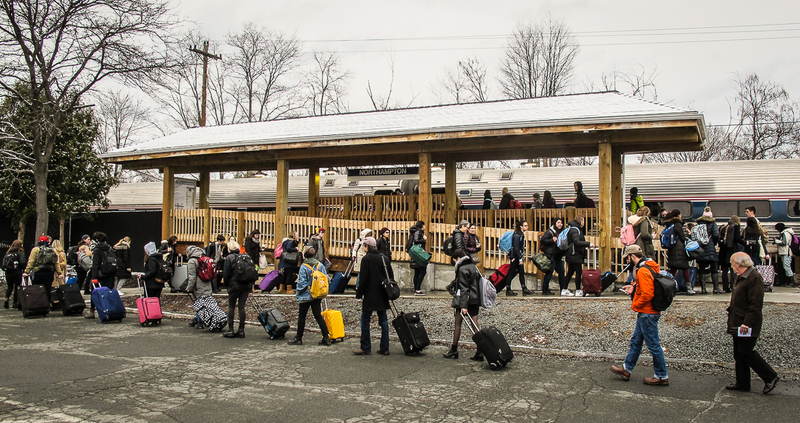 Three local rail advocacy groups — Trains In The Valley, Citizens for a Palmer Rail Stop and The Train Campaign — are rolling out plans in the coming two weeks for pop-up rail advocacy meetings at locations across western Massachusetts. The Massachusetts Department of Transportation (MassDOT) hosted two public information meetings — in Worcester (January 29th) and Springfield (February 2nd) — to present the 2018 State Rail Plan and begin the public feedback process. The plan for the pop-up rail advocacy meetings was quickly pulled together by local advocacy groups earlier this month in an effort to increase public awareness of the now-in-draft 2018 Massachusetts State Rail Plan. Please plan to drop in at one of the many informal pop-up meetings listed below to learn more about the draft 2018 State Rail Plan. Get your questions answered in person by local rail advocates and learn how to make your opinions count by submitting comments to MassDOT. Don’t have time to attend a meeting? If you are interested in the long-term plan for passenger rail service in the Commonwealth — and in the Pioneer Valley in particular — we encourage you to review this summary of the plan on this link: 2018 Massachusetts State Rail Plan Update (prepared by Trains In The Valley). These next two weeks will be the only opportunity to comment on the State Rail Plan until MassDOT’s next update five years from now, in 2023. NOTE that the deadline for MassDOT to receive your comments on the draft State Rail Plan is March 2, 2018. Please note that we are no longer accepting requests for additional pop-up meetings at this time.